Lisa E Design Blog: 2011 - Get Moving! It's a new year and a time for a new notebook. I just finished the cover for my favorite type of Mead notebook - lined pages on one side and grid on the other. 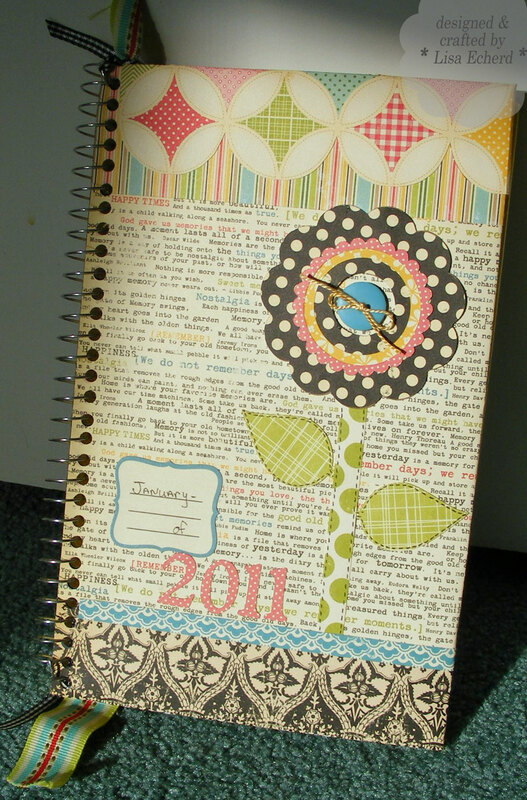 I use it to keep to-do lists, jot down ideas, and keep track of all sorts of every day things. This year I'll also be tracking my progress on my New Year's Resolution - Get Moving! The last two years are the only ones in my life I've kept resolutions for the entire year. For both, I did resolutions around my creative pursuits. Still, they were daily challenges to do things and took a real effort some busy days. I'm hoping I can take some of that creative energy and apply it to an important goal - to improve my physical fitness. I work hard to maintain my weight - mostly by watching what I eat. I've never smoked, I don't engage in any other health risk behaviors that I know of (aren't they always coming out with something new we should or shouldn't be doing?). But I have to admit that one of the other things I don't do nearly enough is Exercise. I've gone through spurts where I took regular walks or swam or went to an exercise class when I worked in an office building years ago. But something always happens and I give up my activity after a year or so. Lenny and I do hike but not often enough, I'm active on vacation. This just isn't enough to maintain my good health long term. I know from experience that my most likely excuse will be having something hurt from a sudden onset of exercise. So I'm looking to start with short blocks of various activities. I'll be gradually building up my muscles and endurance and not forcing myself into a regimen that I know won't last out the month. "Get Moving" to me is to get off the couch or away from the computer and do something active. It might be a household chore, just a walk around the yard or a trip to the mailbox (ours is a long way from the house), or a few exercises while watching a television program. As the weather warms, the list should expand. To count, it has to be something I wasn't going to do anyway. I can't count yesterday's trip to the grocery store (darn). I tried this last year but my resolve only lasted a few days. Part of the problem was I simply forgot about it as it got lost among other resolutions - mainly Project 365 - that I had for the year. This year, this is my one and only Resolution. Oh, I'll have other objectives for the year. The difference for me is that a Resolution is something that takes daily effort and takes the whole year. Hopefully, it changes a habit. Just as 'doing something creatively new every day' has made me continue to increase my crafting skills and problem solve more creatively. I think doing Project 365 will keep me snapping away at those every day events and remembering my camera every time we go for an outing. So every once in awhile I'll blog about how things are going. I'm hoping that by sharing my resolve with readers, I'll be more accountable. Feel free to comment and tell me to "get moving"! This is an October Afternoon-fest! All the papers and the sticker are from OA. 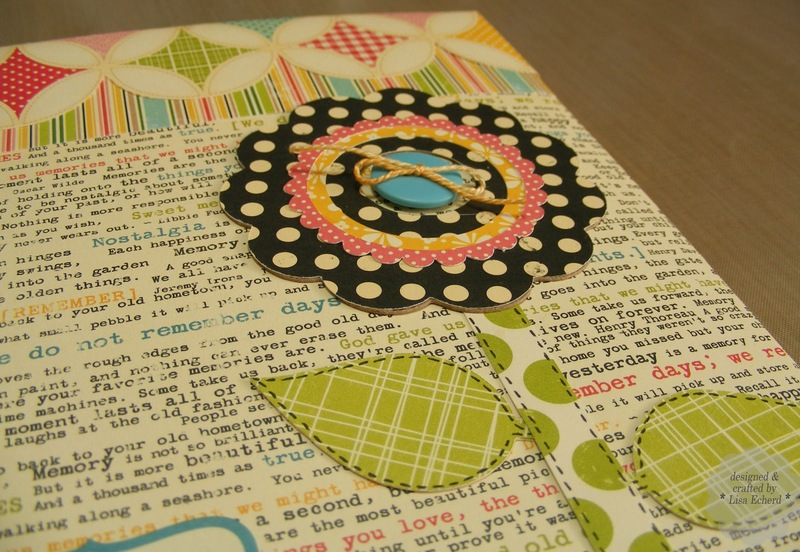 There isn't a piece of cardstock anywhere! For self-gifting this Christmas, I treated myself to a new Cricut cartridge - Straight from the Nest - and used it to cut the flower and the scalloped circle. The flower is cut from thin chipboard as well as designer paper. Because I want the cover as flat as possible, I cut a circle out of the center to nestle the button. The leaves and letters are cut with good ole Plantin Schoolbook cartridge. To balance the colors, I added faux stitching in black on the leaves and stem. Wish me well on my efforts to get moving! Maybe I'll even get a cleaner house out of the deal. What are your resolutions? Did you blog about them? 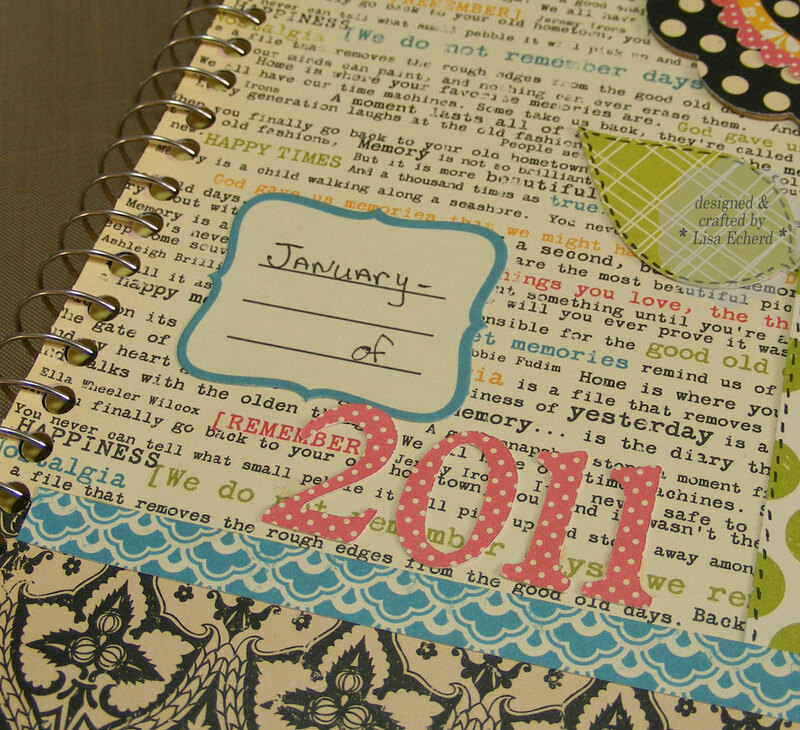 Love the idea of a yearly notebook! Hope you have a wonderful new year. Good luck with your resolutions. Wonderful notebook, Lisa... really a great idea. Best of luck on your 'get moving' resolution. Happy New Year! This is so pretty! Great way to track ideas and resolutions. 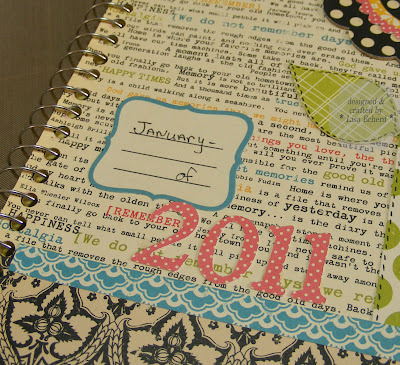 love the great moving journal... did u do obe for 2012.. awesome... thanks for sharing..